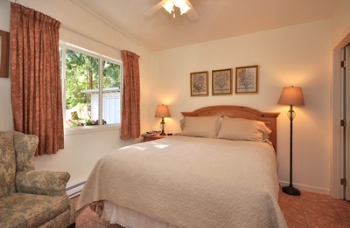 This charming room has a ‘forest’ view looking out to beautiful tall cedars, and guests describe it as "cozy". "This will be one of our great memories of our trip to BC. We were able to spend our weekend enjoying the area and you can't beat that ocean view. 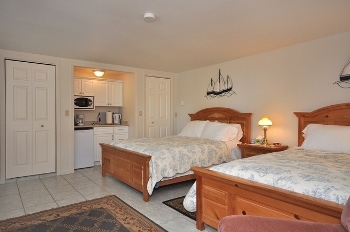 This is truly a top notch B&B and we thank you for your hospitality." Room 27 looks out to the garden with a view of the Strait of Georgia. The early morning sun makes this room bright and cheerful. "My Mother and I came to Caprice for Mother's Day and what a blast! Breathtaking views, a wonderful room and the greatests hosts, and a view looking over the beautiful coastline. Thank you for a wonderful experience we will remember forever"
This spacious and lovely room looks out to the hot tub, pool and terrace with a view of the Strait of Georgia. ~ There is a 2-night minimum stay. ~ Ask about our weekly and off-season rates. ~ Minimum 7 day cancellation policy.